In this introduction, written in 1988, Bradbury recalls receiving fan mail from Richard Matheson, a young, aspiring writer with a few published stories to his credit. Bradbury does not recall what precisely he wrote back to the young writer, except to thank him for his compliments. Bradbury hopes he advised the young writer to write every day for the rest of his life. He goes on to praise Matheson as one of the most important and prolific writers of his day, even if his work is not as well known as those as Isaac Asimov or Arthur C. Clarke. Bradbury goes on to decree that Matheson is a mainstream writer and ridicules the New York critics who ridicule him, Matheson, Asimov, Stephen King, and countless others who write genre fiction. Bradbury’s very short introduction to the book says so much and speaks to me as a person. First and foremost is that admonition that rings in my ears all the time and makes me feel guilty: WRITE EVERY DAY. I know I should. I wish I could. But the daily distraction of life, vocational and leisure, keep me from writing every day as I should. Once upon a time, just a few short years ago, I had a job that had me writing – writing creatively – every day. But that vocation and those circumstances have passed and alas, the reports I write at work and this blog represent my current output of written words. The second point is Matheson’s lack of fame. Even casual fans of horror are sometimes not familiar with his work – or they don’t know they are enjoying his work. I remember seeing The Last Man On Earth as a child and, despite the pitiful cinematography and sound of the low budget move, being riveted to the story. Thank you very much Vincent Price for overcoming the cheap production values to bring Matheson’s tragic character to life, giving him depth, and making him sympathetic. But it would not be until I was an adult that I would learn that this movie was not the product of some anonymous British or Italian screenwriter. The reason the poorly made movie was so good was because it had been penned by one of the masters of genre fiction. As I read more ABOUT Matheson in some of Stephen King’s articles and books on the subject of genre fiction and writing, I came to realize that I had indeed enjoyed a great deal of Matheson’s work. The great Twilight Zone episodes such as Little Girl Lost, Third from the Sun, Steel, and others came from this man. Also, the American International Films (sort of an American version of Hammer Studios) movies where Matheson adapted Poe stories into full length motion pictures were a staple of my childhood. 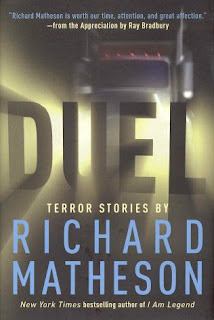 The movie Duel entertained me one late night in my early adolescence and I did not know that I was enjoying the great works of two masters of their respective fields – Richard Matheson and Stephen Spielberg. Matheson’s credits on IMDB.com are as prolific as his list of published novels and short stories. Unlike Stephen King’s body of crossover work, there is a balance of original screenplays and screenplays based on his work. Matheson is not only prolific, he is versatile – perhaps more versatile than any writer in history in successfully crossing back and forth between story writing and screenwriting. I know of no other who does it so well. Finally, there is that ability to easily work between fiction and horror – an ability matched only by Bradbury himself. Matheson wrote material that was pure science fiction, purely horror, and stories that blended both elements just as Bradbury did. King and Dean Koontz, the two most prolific genre writers of our day do the horror stuff as well as anyone. But when they cross over into science fiction or fantasy, the results are uneven. 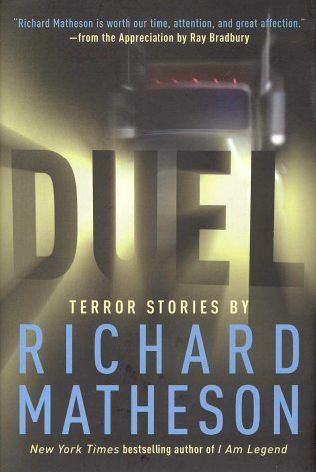 Richard Matheson is one of the five most important writers of our time. It was he who inspired Stephen King. It was he who inspired George Romero and John Carpenter. It was he who gave the great Stephen Spielberg his first vehicle to tell a strange and terrifying tale. I would dare say that no other person has had such a profound influence on two distinct, but related writing formats. It’s a great shame that not more know that they have partaken of this man’s work and enjoyed it. A salesman is traveling across a desolate part of California en route to San Francisco when he encounters a slow moving tanker truck on a two lane road. He passes the truck so he can maintain his speed and make his sales call in time. But the trucker has other plans. A chase ensues across the deserted highways as the man named Mann battles for his life in a road rage fight for his life. Mechanized horror is hard to do because it is so easy for a writer to get caught up in the mechanics of the monster. Witness Stephen King’s The Mangler. It has been stated by a number of critics of the movie that what made the truck such a malevolent monster was the fact that you never saw the driver. This is true of the short story as well. There is no humanity in Mann’s adversary. Although Mann catches glimpses of the driver’s hand and a brief glimpse of his profile, he knows nothing about him or his seemingly mindless motivation to kill him. Furthermore, the machine has no humanity. When King wrote Christine, the evil car definitely had personality and motivation. Matheson’s truck, named Keller by the sign painted on the door, is like a serial killer; soulless and without motivation. A gripping tale. This story was adapted to screen by Matheson and directed by Steven Spielberg. It starred Dennis Weaver as Mann. A scientist, sure that the planet is doomed to atomic extinction, prepares his family and their best friends to leave in a spaceship he has designed and built at the military base where he works. They ponder the moral implications of fleeing the planet rather than helping to save it. This is an average short story. However, Rod Serling retooled it and made it into one of the most powerful Twilight Zone episodes ever. Instead of pondering the morality of their actions, the families instead deal with the tension of their plans being discovered and thwarted. This story was originally published in Galaxy, October 1950. An eight year old child, deformed and inhuman, is locked in a cellar by “its” parents and left to suffer out of sight and mind. He observes the outside world and comes to resent the neglect and abuse heaped upon it by its parents. He soon becomes resentful and resolves the next beating will be his last. . .
Exceptionally well crafted narrative! Matheson tells his story with simple, primitive, almost gutteral prose. The creature in the basement is truly amoral and dangerous! Note: This story is spoofed to a degree in The Simpsons in a Treehouse of Horror episode when Bart is locked in the attic and forced to eat fish heads. Born of Man and Woman was originally published in Fantasy and Science Fiction, Summer 1950. In a future where all labor is mechanized and all but a few men are born to leisure, a group of soldiers fights a never ending battle against alien invaders always seeking to invade and destroy the machines that maintain man’s leisurely existence. This story had a great twist. Matheson uses a second person narrative to tell the story, making the twist entirely plausible. I can’t recall ever reading a story told in second person. A well written gem of a story! When the Waker Sleeps was originally published in Galaxy, December 1950. A scientist departs on a mission of time travel 500 years into the future. As he leaves, he promises his wife he will return in time for supper. But something goes wrong in the time machine just as he makes the jump. He arrives alive in the 25th century and finds an advanced race of humans eager to talk to him to compile information for their library. But he is only interested in finding a way to get back to his wife. Love is brought to the fore of more Matheson stories than any horror writer I’ve read. Matheson plumbs the depths of his married characters here and other novels such as What Dreams May Come. This story is similar in that a couple deeply in love are separated by life, death, and time. In a future where man and machine coexist in society, performing the same tasks, jobs, and duties side by side, one man has had enough. He walks away from his job. In a society driven by labor, the slacker becomes the object of a search and destroy mission. The man, a military strategist throws of f the dehumanizing life of constant work and tries to flee the city. This story was much weaker than most of Matheson’s work. I get the metaphor of the military strategist and the robotic nature of his work plotting troop movements all day. But the character was woefully underdeveloped and the metaphor never really fleshed out. Brother to the Machine was originally published in Worlds of If, November 1952. A time traveler from 1954 to the future finds there is another “F-word” not spoken in polite company. It’s a word that you and I use every day for a substance that the fortunate of us encounter several times a day – sometimes more often than we should. This substance becomes an abomination because of an environmental cataclysm. The time traveler deals with his future shock and his cultural crime. This story is best described as a farce. The title is designed to put our minds in a prurient place. But the source of the profanity is just a few inches north of the source of prurience. It’s a mildly entertaining tale, but a clever idea. A warehouse manager is sent to manage a shipping facility on an alien planet. All of his workers are dull witted males. The only female of the race known to him is his maid and caretaker who calls herself, “Lover.” He finds his predecessor’s journal and reads a chronicle of a man driven to near insanity. Through Lover’s constant attention, he soon finds out what drove his predecessor to near madness. What I appreciate about Matheson’s sci-fi – as opposed to the likes of Robert Heinlein, is his focus on character and emotion rather than technology. Like much of Matheson’s work, emotion is at the fore in this story and come to sympathize with the hero and his desire to be left alone. A woman is convinced that something just isn’t right with the apartment building she and her husband lives in. The rent is too low and the custodian is a strange looking fellow. When she investigates, she finds that there are rocket engines in the basement and a third eye in the back of the head of the custodian, she convinces her husband and her neighbors. But if you think their apartment building is an alien ship, you are wrong. . . 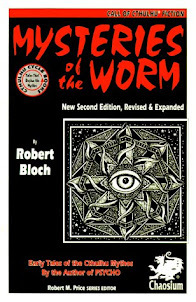 The twist, such as it is, is not well concealed. The story moves along nicely and its primary character is strong. A college student answers and personal ad placed by a woman who claims to be from Venus. He becomes the subject of her ardor and, as is tradition, the wedding will be on her home planet. Told through an exchange of letters, this is a deftly drafted piece of dark humor. SRL Ad was originally published in Fantasy and Science Fiction, April 1952. A rocket patrolling for planets to be candidates for human settlement finds a crashed rocket on one of those planets. When they board the derelict rocket, they find their own dead bodies in the crash. They struggle to understand the how and why of the situation. This interesting tale was made into an episode of the Twilight Zone. It was a season four episode which was an hour long. Many of the longer Twilight Zones were dull, but this was one of the more intriguing and engaging. A young man wakes up in an apartment full of drunken, stinking people on what is sure to be the last day of existence, for the Earth is moving toward the sun and soon it will be too hot for life to go on. He and another fellow decide elect to spend the final day with their families rather than in drunken acts of debauchery, so they head out into a world where civilization has collapsed. Their only goal is to get home. When he gets there, he spends those final moments with his mother whom he was at first reluctant to see. This was less a story and more a character study of how people might react knowing that it was not only their last day, but everyone’s last day alive. A man and a woman are awakened by the terrified screams of their daughter, sleeping in the living room on a fold out couch. Figuring that she was having a bad dream, her father goes to calm her down. When he gets there, he can hear her voice under the couch just as if the girl were sitting next to her talking. The only thing he can think to do is call his friend who is a physicist. His friend comes over and figures out where the girl has gone, but can not devise a solution. It is the family dog who finally figures things out. It’s difficult for me to evaluate this story as a stand alone story for I have seen the compelling adaptation Matheson penned for the Twilight Zone. I can say as a parent whose child has been reported missing to the police, I can say that Matheson captures that emotion well in his prose. But, on the written page, the story is not nearly at riveting as the screen adaptation. Little Girl Lost was originally published in Amazing, October/November 1953. A man returns home from a five month long business trip to find out that his wife is about three months pregnant. She swears that she has been with no other man and implores her to believe him. He is not as strong as Joseph and cannot get past his scientific knowledge of the coupling necessary for conception (at the time this story was written). While the couple struggles along in their badly damaged marriage, she develops a taste for broad education and devours books on world cultures, politics, and science. She also develops an incredible ability to recover from disease and injury. As the man watches these remarkable developments, he becomes convinced that his wife was the victim of an unspeakable act. He worries about the child that is coming. . .
Any well read reader of sci-fi knew where this story was going. However, as I read it, I reminded myself that Matheson was a pioneer in developing this type of alien impregnation story. He may not have been the first to write such as story (or perhaps he was), but he was one of the earliest and certainly refined the sub-genre with quality work such as this. Trespass was originally published in Fantastic, September/October 1953. A man and a woman plan to travel across the U.S. from Los Angeles to New York to visit the woman’s family. They stop at a remote gas station for ethyl and water for their constantly overheating radiator. There, they are taken prisoner and kept in a zoo by a man who serves an alien being with an insatiable appetite. As I read this story, the mental imagery unfolded in black and white. This story would have not fit into the Twilight Zone motif, but would have worked with the slightly campier and hard sci-fi oriented Outer Limits. There was a great deal of action for a Matheson sci-fi story which are usually more contemplative in nature. Oddly, Matheson never wrote for, nor were any of his stories adapted for The Outer Limits. In a future that uses geriatric extermination as a means of population control, a young man struggles to help his father study and practice for the test he will have to take to demonstrate that he still has the physical and mental stamina to participate in society. The father knows the test is beyond his ability, and reacts bitterly. The young man wrestles with anger with his father for being so unconcerned about his fate, and his feelings of guilt for looking forward to being free of the burden that is his father. This story was a thinly veiled parable about the guilt that children and caregivers feel about the happiness they secretly feel when their charges finally pass. It’s real and it’s natural. I have felt it myself. So is the guilt.for feeling that way. A janitor at a college wakes up one morning to find he can speak French fluently even though he knew nothing of the language the night before. Soon, he starts mysteriously acquiring knowledge about physics, biology, sociology and anthropology. He loses the ability to control when he speaks English and when he speaks French. He constantly blurts irrelevant information at inopportune times. He is summoned to appear before a panel of psychologists who probe his level of knowledge in various fields. Finally, he walks away from the panel and heads home. As he leaves the building, he finds the true purpose of his knowledge acquisition. What struck me immediately about this story was how it started much like Franz Kafka’s Metamorphosis with the strong declarative sentence. “When he woke up that morning, he could speak French.” Fred Elderman’s alienation is not so nearly dramatic as Kafka’s Gregor Samsa, but this is a great alienation story. In the 1990s, robots have replaced humans in the boxing ring. Robots duke it out while their owners collect the rewards. The owner of a decrepit boxer and his mechanic prepare their robot to fight a much newer and stronger opponent. Just before the fight, the robot breaks down. The owner decides to step into the ring and take on the robot. I have seen the Twilight Zone episode too many times to read this story and watch events unfold as they did on that show. The Matheson's script was a better story than his story. A couple of corrections (the director of DUEL was Steven Spielberg; "Little Girl Lost" and "Steel" were adapted for THE TWILIGHT ZONE not by Serling but by Matheson himself) and a few points of possible interest. "Shipshape Home" became what was likely the first Matheson adaptation ever when it was made into an episode of the Heinz-sponsored anthology show STUDIO 57, "Young Couples Only," in 1955. "Trespass" certainly predated John Wyndham's similarly themed THE MIDWICH CUCKOOS (memorably filmed as VILLAGE OF THE DAMNED) and was adapted by Matheson into the TV-movie THE STRANGER WITHIN, now available from the Warner Archive collection. Grade-Z filmmaker Larry Buchanan made an uncredited bastardization of "Being" entitled "IT'S ALIVE!" Although Matheson's work never appeared on the original OUTER LIMITS, his daughter Ali Marie and her husband adapted his story "First Anniversary" for the revived version, and Matheson himself scripted "One for the Books" as an episode of AMAZING STORIES. I got the Spielberg correction made. I spelled it with a "u" instead of an "e". As far as the Matheson screen credits, I stand corrected because Matthew Bradley is THE definitive expert on Matheson's body of work, having published a book or two on the subject. IMDB lists both Matheson and Serling as writers of Steel and Death Ship. I took that to mean a Serling screenplay from a Matheson story. I've never seen that version of "It's Alive" which does not rate well with IMDB viewers. I've seen the 1970s version that is an entirely different story. 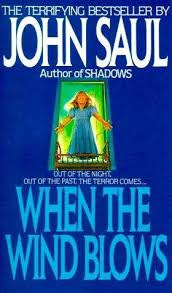 I knew of Wyndham's writing the story that would become "Village of the Damned." I've seen and enjoyed the early version of the film. I have the Carpenter remake in my Netflix queue to watch. I've never read the story nor have I read the story he is best known for which is "Day of the Triffids." I enjoyed Wyndham's "Rebirth" a great deal. Thanks Matthew. Your input is always welcome here. I agree with you about Matheson's largest problem being a lack of fame. I didn't know until a couple of years ago that those great Twilight Episodes were either written by him or inspired by his writings. My first exposure to his writings was "I Am Legend" which i have in a collection of his stories. I do find his writings uneven though, while some of his stories are gripping and horrifying others are not so great and some are even bland. Yet overall I found him to be quite an entertaining writer. Buchanan's "IT'S ALIVE!" (whose title is differentiated from that of Larry Cohen's unrelated 1974 effort by its punctuation) is a bottom-of-the-barrel effort made to round out a package of films for AIP Television, and should be avoided by all but the most die-hard Matheson completists or fans of Bad Cinema, of which I am both! Wyndham's THE MIDWICH CUCKOOS and THE DAY OF THE TRIFFIDS are eminently worthwhile reading, and I especially enjoy the first filmed versions of each novel, although TRIFFIDS has its detractors. Speaking of which, rdxdave is quite correct that Matheson has had his off days just like anyone else, on both page and screen. Ditto the IMDb, since Matheson's TWILIGHT ZONE scripts for "Little Girl Lost," "Steel," and "Death Ship" are a matter of published record, and reflected in the onscreen credits of the episodes themselves. I'm happy to report, by the way, that RICHARD MATHESON ON SCREEN is going back to press for a third printing. Appreciate the tip of the hat! I think that every professional writer has published material that he or she would like to have back. Whether it was written when they were young and experienced, or they were on deadline, they can't all be great stories. Robert McCammon, at one point, had halted printing of all of his early work because he felt it was immature. I disagree with him and as a reader, feel much more qualified to tell Mr. McCammon that his early work was spectacular than he is. Even the vaunted Stephen King, who is as perhaps as defensive about his work as anyone, admitted in "On Writing" that Insomnia was not a very good novel. I suspect King has a few other stories or books he knows aren't very good. Matheson isn't always spot on, but he is consistently great, often brilliant, and at times, revolutionary in his storytelling.